The Outer Banks are a chain of barrier islands that skirt the coast of North Carolina from the Virginia border to Cape Lookout through Currituck, Dare, Hyde, and Carteret Counties. More than 175 miles long, they are separated as much as 30 miles from the mainland by a series of shallow sounds. Pamlico Sound, the largest sound on the East Coast of the United States (and some say the world's largest), is 80 miles long and 15 to 30 miles wide. It is separated from the Atlantic Ocean by a part of the Outer Banks and drains into the Atlantic Ocean through Hatteras and Ocracoke Inlets. Albemarle Sound, the second largest (some 50 miles long and 5 to 14 miles wide), was named after George Monck, duke of Albemarle, one of the Lords Proprietors of the Carolina colony. The state's first permanent settlements were made along its northern shore. Other North Carolina sounds include Core Sound, Croatan Sound, Currituck Sound, and Roanoke Sound. The topography of the Outer Banks is constantly changing, as inlets open and close and beaches narrow and widen. Windswept and remote, the islands were sparsely populated until the paving of roads, the construction of bridges such as the Herbert Bonner Bridge in the 1960s, and the institution of large-scale ferry service between Ocracoke and the mainland and Ocracoke and Hatteras islands. Once largely uninhabited except for small villages, the Outer Banks are now a popular tourist destination and the permanent home of increasing numbers of residents. The first inhabitants of the Outer Banks were Native Americans. Many place names, such as Hatteras, Ocracoke, Kinnakeet, Chicamacomico, Manteo, and Wanchese, bear testimony to these early residents. Native Americans on Hatteras Island befriended explorers Philip Amadas and Arthur Barlowe in their reconnaissance mission for Sir Walter Raleigh. Conflicts with Europeans, combined most likely with disease, led to the virtual disappearance of Native American tribes on the Outer Banks by the seventeenth century. During the colonial period, European settlement on most of the Outer Banks was sparse. After the English failed to establish a permanent settlement at Roanoke Island in the 1580s, few Europeans showed interest in the Outer Banks for the next century and more. In the eighteenth century, probably the most strategic and most heavily populated area of the Outer Banks centered around the islands of Ocracoke and Portsmouth, where colonial shipping found entrance into the southern Pamlico Sound and on to coastal towns like Bath. The inlets and isolation made the Banks attractive to pirates and smugglers; famed pirate Blackbeard (Edward Teach) met his death in the sound waters off Ocracoke, one of his bases of operation. The importance of this part of the Outer Banks to shipping and travel can be seen later as well, in the construction during the early national period of the Ocracoke Lighthouse, operational in 1819. During the nineteenth century, the Outer Banks remained remote, physically and culturally isolated from mainland North Carolina. Generally removed from the mainstream, Outer Bankers lived a subsistence lifestyle that combined fishing, the salvaging of shipwrecks, piloting of vessels through inlets, and waterfowl hunting. A distinctive English dialect, called the Ocracoke brogue-featuring the unusual pronunciation of the vowel "i" as "oy," leading to the nickname "Hoi Toiders" for those who speak it-developed and remains as a reminder of the remoteness of past Outer Banks communities. Among the affluent planters of the Albemarle, the custom evolved of vacationing in summer at locations such as Nags Head. Nevertheless, the islands remained largely untouched by outside influences. During the Civil War, occupation of the various inlets along the Outer Banks made the remote islands strategically important to both the Confederacy and the Union. The latter succeeded in occupying the islands throughout most of the war. Changes in technology, transportation, and economy began to affect the Outer Banks in the late nineteenth century. The construction of the Albemarle and Chesapeake Canal by 1859 connected the upper banks with the mouth of the Chesapeake Bay. After the Civil War, the canal became integral in the development of new economies on the Outer Banks. A shift from subsistence living to commercial fishing and oystering occurred, as the lives of people on the Outer Banks became intertwined with regional and national market needs and trends. The increasing presence of summer visitors at places such as Nags Head and the arrival of sport waterfowl hunters each fall along the length of the Outer Banks also marked the latter part of the nineteenth century. In the early twentieth century, the Outer Banks began to feel the pull of mainstream life, and their windswept beaches and dunes earned them a place in history. From January 1901 to August 1902, Reginald A. Fessenden succeeded in sending wireless messages from a tower on Roanoke Island to Cape Hatteras and to Cape Henry, Va. He also received musical notes transmitted from Cape Hatteras. On 17 Dec. 1903, Wilbur and Orville Wright flew an experimental motor-driven airplane for 12 seconds at Kitty Hawk, changing transportation forever. Two world wars brought submarine warfare to the coast of the Outer Banks, especially in the waters off Hatteras Island. The advent of the affordable automobile combined with the paving of roads, especially U.S. 12 on Bodie, Hatteras, and Ocracoke Islands, began to transform the Outer Banks in the 1920s and 1930s. Federal New Deal funds allowed for road paving and dune stabilization, and large tracts of land were designated in 1937 for the creation of the Cape Hatteras National Seashore. This was followed just before World War II by the creation of the Pea Island National Wildlife Refuge. Although regions of the Outer Banks have remained among the least developed stretches of seashore on the Atlantic coast of the United States, increasing tourism and contact with the outside world has led to tremendous development in the area. Approximately 7 million visitors from around the world stay for short or extended periods in the Outer Banks, enjoying ocean activities such as swimming, hang gliding, fishing, windsurfing, and bird watching as well as cultural activities. The Outer Banks History Center in Manteo has thousands of manuscripts, pamphlets, photographs, maps, paintings, and other items related to the history of the area. Population growth in the Outer Banks has been approximately double the North Carolina average. By 2004 the year-round population of the banks had increased to more than 45,000 people, creating great demand for new housing, particularly in the northern areas. John Alexander and James Lazell, Ribbon of Sand: The Amazing Convergence of the Ocean and the Outer Banks (2000). Dirk Frankenberg, The Nature of the Outer Banks: Environmental Processes, Field Sites, and Development Issues, Corolla to Ocracoke (1995). Thomas J. Schoenbaum, Islands, Capes, and Sounds: The North Carolina Coast (repr., 1988). Stick, An Outer Banks Reader (1998). Starkweather, Sarah. 2012. 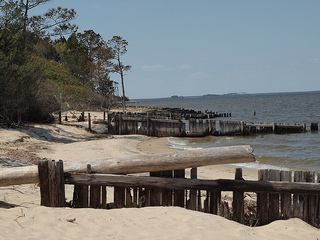 "Outer Banks 4 - Roanoke Island." Online at Flickr at http://www.flickr.com/photos/sarah1rene/7250632648/. Accessed 6/28/2012. 1 January 2006 | Carter, Kathy; Williams, Wiley J. In addition, you will find citations throughout the book to other papers written on this topic--this information may help you in your research. Not a comment, but a question. Back in history when Edenton and Plymouth were important seaports (civil war and before ? ), was there a direct opening east from the mouth of the Albemarle Sound to the Atlantic Ocean through the Outer Banks? If so, any reference to map of same? Thank you for your time in answering this question. Thank you for your question. Are you asking if there was a way for ships to reach the Atlantic Ocean without first having to sail south through the Pamlico Sound? If so, the answer seems to be yes: the Okracoke Inlet was a way for ships to "cut through" the Outer Banks. I hope the links below will be helpful. Please let me know if I misunderstood your question.